A waxy, prolific vine with a long-lasting star-shaped pink flower, very waxy thick leaves. A slip of this plant was given to me by our County Treasurer 5 yrs ago, as a cutting. Flowering began in early spring, March, I think , and lasted through June. Very easy to grow. What is it? A fellow Ravelry.com member saw my picture in my Flickr photo albums and knew what it was right away! The easiest plant to grow, it only requires occassional watering (every 2-3 weeks), medium light exposure (mine is in a west window) and little attention. Too much water can result in an occassional yellowing squishy leaf-just pluck it and drain off any water left standing in the catch tray. They don’t like their feet wet. Alternately, too little water will result in a single leaf withering and drying up. It will be virtually impossible to kill this vine by neglect. Hoya is a genus of 200-300 species of tropical climbing plants in the family Apocynaceae (Dogbane), native to southern Asia (India east to southern China and southward), Australia, and Polynesia. Common names for this genus are waxplant, waxvine, waxflower or simply hoya. This genus was named by botanist Robert Brown, in honour of his friend, botanist Thomas Hoy. Hoyas are evergreen climbing vines or shrubs growing to 1-10 m (or more with suitable support in trees). They have simple opposite leaves 5-30 cm long that are typically succulent, and in many species are flecked with irregular small silvery spots. The flowers appear in axillary umbellate clusters at the apex of 2-3 cm peduncles, with repeated clusters of flowers developing sequentially on each peduncle. The flowering peduncles get 2-3 mm longer with each flowering, and can eventually reach 7 cm or more long; the base of the peduncle is smooth, with growth subsequent to the first flowering of the peduncle is rough with numerous tiny bracts. Each flower is about 1 cm diameter, with five thick, waxy, triangular petals; colours range from white to pink or yellow. They are sweetly scented and produce abundant nectar. 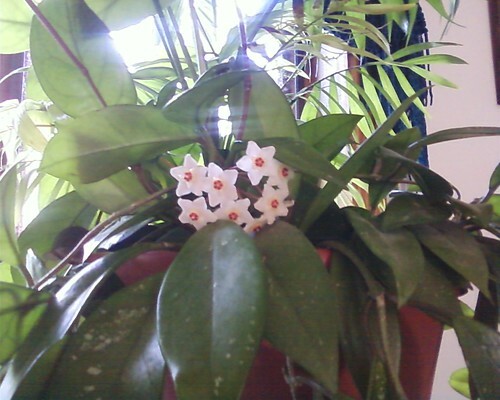 Many species of hoya are popular houseplants in temperate areas (especially H. carnosa), grown for their attractive foliage and strongly scented flowers. Numerous cultivars have been selected for garden use. Hoyas grow well indoors, preferring bright but not direct sunlight, but will tolerate fairly low light levels at the expense of rapid growth and blooming. Hoyas commonly sold in nurseries as houseplants include cultivars of H. carnosa (Krimson Queen, Hindu Rope − compacta), H. pubicalyx (often mislabeled as carnosa), and H. kerrii. Hoyas are easy to purchase on the internet, and are commonly sold as cuttings, either rooted or unrooted. More pictures and information on this exotic plant can be found on Wikipedia.